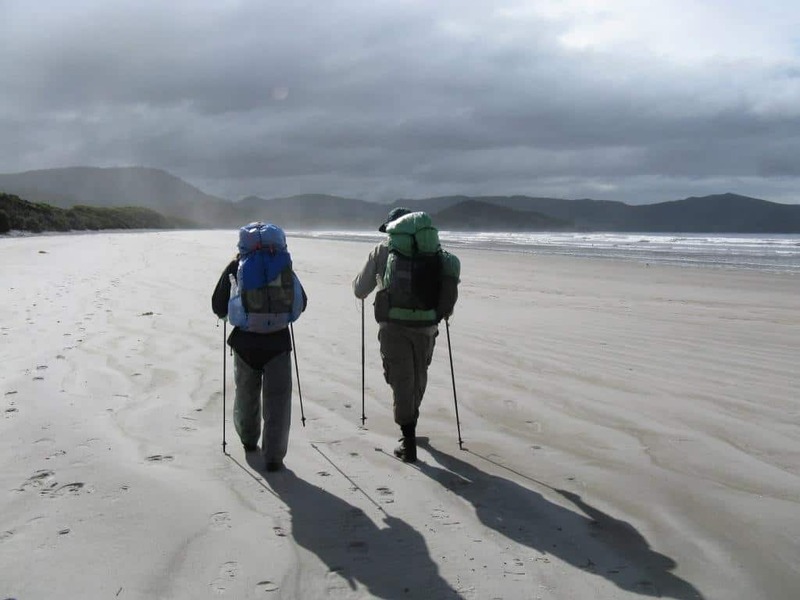 A warning to those considering hiking Tasmania’s South Coast Track. 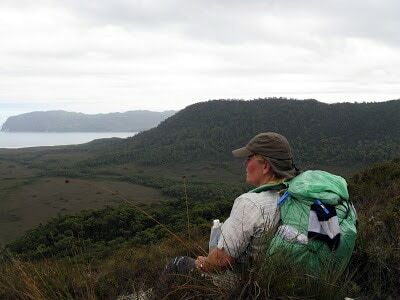 It is now a full week since we reached Cockle Creek after completing the South Coast Track wilderness walk. After a week, I finally feel a little recovered and therefore equal to the task of recording the experience, so that others contemplating the walk may be better prepared than we were. First of all, we thought ourselves well enough prepared for the trip. 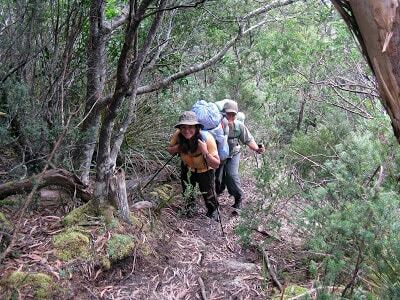 We had read John Chapman’s book, checked out reports and video footage on the web, were experienced lightweight backpackers and were reasonably fit. 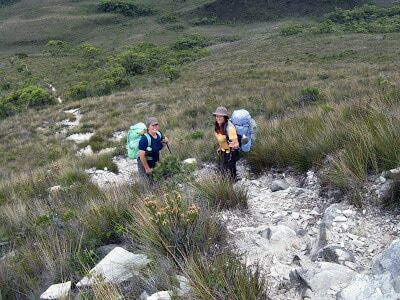 Most reports of the walk described it as ‘easy’ while some suggested that it might challenge those inexperienced at long hikes. John Chapman’s book recorded the estimated track times as being fairly reasonable: apart from 2 long days (6-9 hours and 5-7 hours respectively) all the track times seemed to suggest a comfortable half-day’s walk. It was our trust in this document that was our undoing! 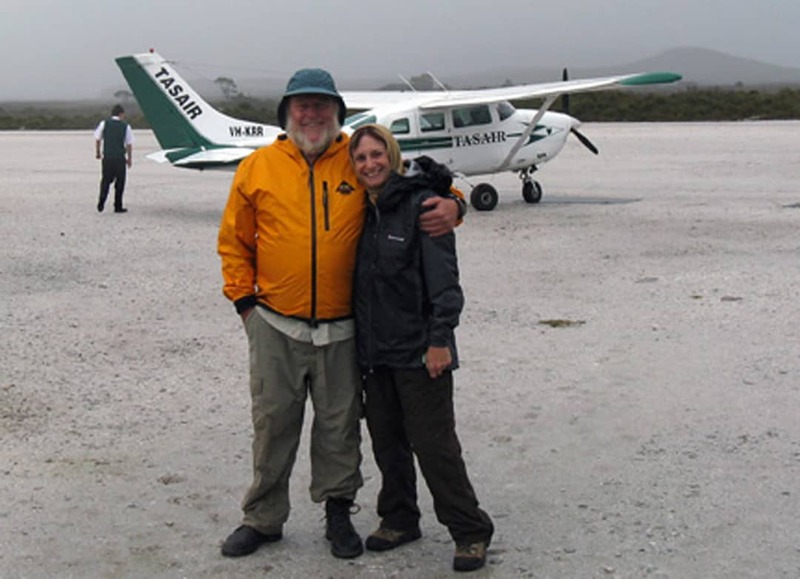 Having left our warm beds at 2.45 am for the drive to Melbourne Airport, we were already a little groggy by the time our Cessna touched down on the airstrip at Melaleuca. 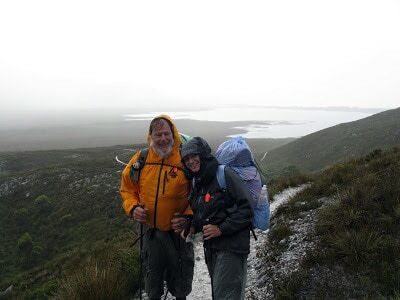 Despite the glowing weather forecast for the whole period of our walk, the cloud had closed in half way between Hobart and Melaleuca, and we disembarked to a light drizzle. 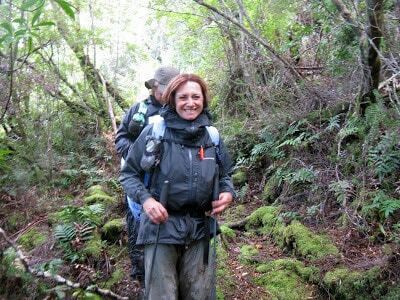 Spirits high, we zipped up our jackets, hoisted our packs and set off for what was touted as an easy walk over a well-maintained track across open buttongrass plains. Perhaps it might have been once…. The boardwalks were deceptively accommodating, but they began and ended abruptly, frequently tipping us unceremoniously into boggy patches of mud. The worst part was the wetness of the boardwalks which were, in many places, so slimy that they were as slick as ice. 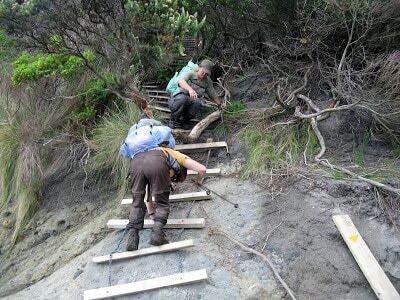 Only careful, ponderous steps could ensure that we didn’t break any bones on this first section of the walk. All the while, the rain intensified, and I was thankful that I had invested in a good quality ‘Event’ rain jacket. 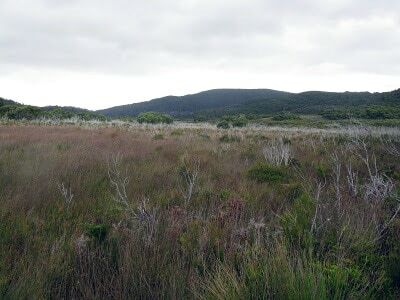 The wind whipped mercilessly across the swamp, and the eerie lack of any sight or sound of wildlife in this endless wasteland brought to mind some half-forgotten lines of poetry from John Keats: …the grass has withered from the sedge/And no birds sing. Not quite sure of the accuracy of the line, nor of the poem’s title, but I do remember that the line was preceded by: Oh what can ail thee knight at arms/Alone and palely loitering…. The barrenness of this first day’s walk was certainly encapsulated for me in Keats’ words. 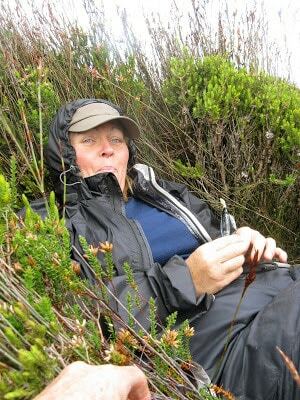 We gave up looking for a suitable spot to eat our packed lunch, settling for stepping off the track and sitting atop prickly bushes to keep our backsides out of the mud while we gulped down our food before the cold could penetrate our bodies. 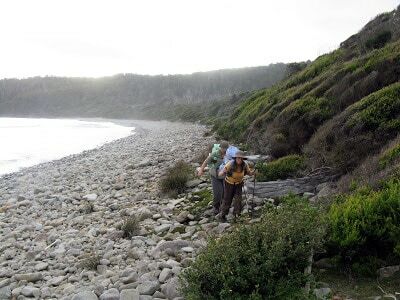 Shortly before reaching Freney Lagoon campsite, we met a man heading back to Melaleuca. He had walked for 2 days and then decided to return to Melaleuca instead of completing the walk. We should have talked to him further! The Freney Lagoon campsite was reached via a stretch of lovely (though bleakly grey) beach, and it certainly looked as if our traverse of the ugly plains had rewarded us with some better scenery. Our aim had been to push on (perhaps another hour and a half) to reach the third campsite, Buoy Creek; but evening was not far off, and our early start was beginning to take its toll, so we called a halt and set up camp. 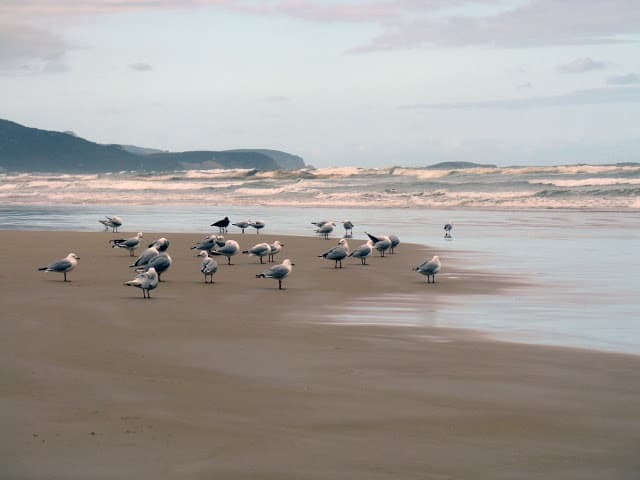 By the time we had broken camp, the sun was shining and our walk along the beach to Buoy Creek was lovely. Sadly, this was over quickly, and from Buoy Creek we headed inland again over kilometres of muddy, wet plains. At first we tried to skirt what we could of the deeper mud, but eventually we had to just wade on through it to avoid the possibility of foot injuries. The track eventually led us to a steep climb (255 metres) over the Red Point Hills: hard going, but drier. 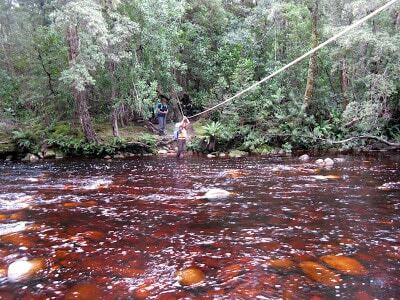 By around 3.00 pm we reached the colourful waters of the Faraway Creek crossing where we stopped for a brief swim to remove the accumulated mud and sweat. Unfortunately we didn’t dally over this, which proved to be our only opportunity to bathe on the walk… The high tanin content of the streams in this region renders the water the colour of strong urine when collected in drinking bottles. In the Faraway Creek, it was a deep orange…kind of attractive, in an odd sort of way! I may never approach Twinings Orange Pekoe tea with the same gusto again, however! Sadly, we had misread the track guide at this point, and confused Louisa Creek with Louisa River: a small point, however it meant that we still had a good 2- 2.5 hours’ walk ahead of us, according to Chapman’s book. The fact that, despite a solid pace, this section took us 4 hours, created the first stirrings of unease in us…How could we possibly take more that twice the recommended time? I had been dreading the Louisa River crossing after seeing footage of it on the web. For many walkers it seemed threateningly high and fast. We were in luck, however, and the river was only knee deep, so we struck a grateful camp, just before darkness fell, and left the crossing for the morning. 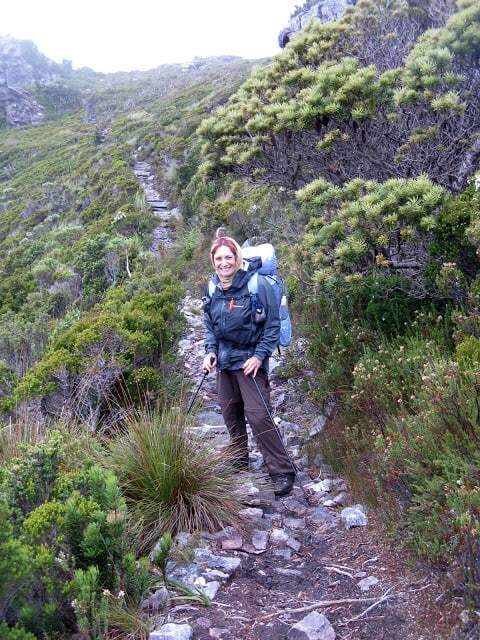 We had always expected this to be the big day, the climb of over 900 metres straight up and over the Ironbound Range. It certainly looked formidable as it towered above us in the morning! The weather forecast before we left home had this day tagged as a hot one in Hobart (high 20’s) so we hoped to accomplish the ascent before it became too warm. The track was well maintained in this section, with much step-work to make the climb safe. We happily completed the ascent in about 3 hours, which buoyed our spirits considerably. The traverse of the summit, however, seemed endless, as the cloud engulfed us and a fine sleet set in. The way was cold, blind and windy. We forged doggedly ahead, hoping the descent would begin soon. My mother always warned me about being careful with regard to what I wished for…the descent was horrendous! 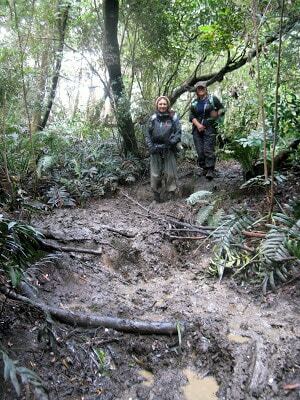 Steep, plunging, muddy, heavily eroded, laced with treacherous tree roots, the descent had become a deep channel for all the water draining from the summit. And it continued for hours without let-up. The high camp was a possible lunch stop, but the alpine weather was so bleak that we just ate a muesli bar and stumbled on. By late afternoon we were only just passing the mid camp, which was unsuitable for spending the night due to a lack of water. We pushed on further, and I started to go lame in response to the jarring nature of the steep descent on a knee muscle injury I had incurred the previous day. 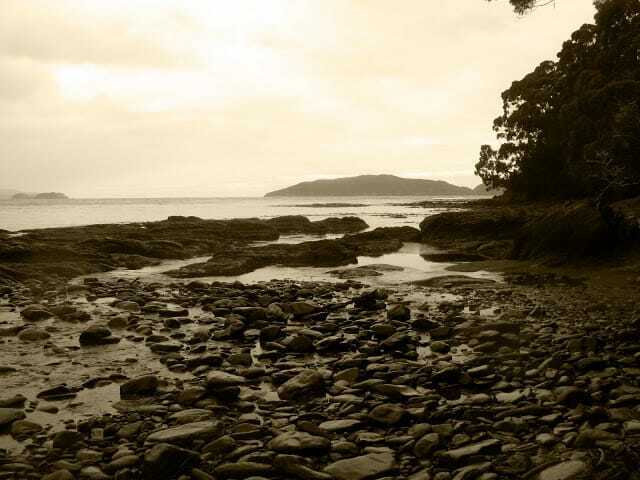 By the time I alerted Steve and Kerri to my pain, and then waited for the pain killer and anti-inflammatory to ease things a little, time had hurried on and we could see that we had no hope of reaching Little Deadman’s Bay before dark. Our only hope was the Low Camp, which had no water. Fortunately, when we reached it half an hour before dark, there was just enough room to pitch our tents (albeit in a low, wet soak) and send Steve off to find the creek further down the track. Blessedly, the rain was not too heavy, but enough, nevertheless, to make tents and sleeping bags damp, so that we craved an earlier and drier camp the next night. Chapman’s book had this section tagged as 6-9 hours. We took 13 hours. As we descended, another poem from my past infiltrated my brain. It was written by Robert Browning, and entitled: Child Rolande to the Dark Tower Came. While I didn’t know all the words off pat, the first 2 lines came back to me strongly after simmering in my long-term memory for the last 40 years or so. The bleak atmosphere of the poem was well remembered too, and stayed with me for the rest of the walk. Its edge at one more victim gained thereby. And so on the poem goes. Apart from changing “dusty” in stanza 2 to “muddy”, I think the poem applies perfectly to Chapman, with me as his bitter victim. 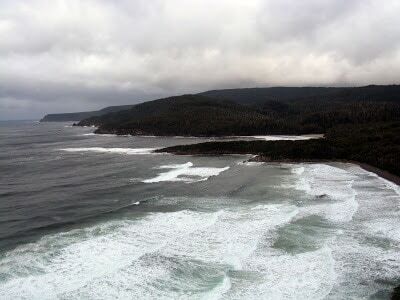 Chapman had this day tagged as 3.5-4 hours walking from Little Deadman’s Bay. We still hadn’t reached Little Deadman’s Bay, so we had to add on the extra time, however long that would be. Well, the walk to Deadman’s Bay took us a further 3 hours of treacherous, muddy descent, so even without the slight delay of my sore leg the night before, we had had no hope of reaching the camp. Good thing we camped where we did! And so onward: more boring, buttongrass plains, but no boardwalks now, just mud….vast stretches of it, often thigh-deep, and always unavoidable. Some pretty forest sections on this day which were drier going, but all in all, 9 hours of walking without a break. 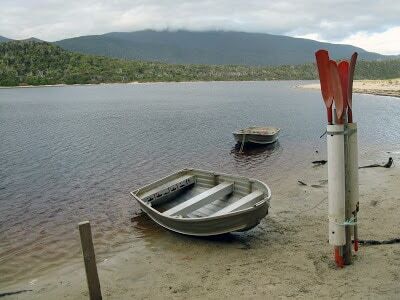 The Prion Boat crossing was manageable, thanks to Steve’s capable rowing, but by then we were totally exhausted and in need of setting up camp to dry our bedding from the previous night. Chapman estimates this day as 4.5 – 6 hours: we took about 10 hours. Muddy plains, steep climbs, light forest, some beach views, no time to stop…by now I was well and truly over this walk. Surprise Bay had been billed as lovely, but the weather was grey and I was too tired to enjoy anything. Time to heat some real lunch would have been good, but we made do with muesli bars yet again. The final stretch along Granite Beach to the campsite was across huge boulders, so easy to balance on with full packs, cold, numb, wet feet and encroaching exhaustion. As we neared the waterfall cliff that marked the campsite, we realised that the tide was rapidly coming in, and the small area of rocks at the base of the cliff was diminishing. Looking for the path upward, we realised that there wasn’t one: we just had to clamber up the cliff face using hand and toe holds where we could. At any other time, I would have baulked at this and said that I could not possibly achieve it. This evening, with the incoming tide pounding threateningly at my back, I shinnied up the cliff without a pause. Marvellous what fear and desperation can do! Chapman says 5-7 hours for this day: yesterday we met two separate walkers coming in the opposite direction who said that they took 10 hours, and that the mud was hip- deep. A day to look forward to! We rose at 5.45 am, in order to hit the track as early as possible, as, in addition to the reported mud, we had to climb up and over the South Cape Range – a mere 715 metres or so! 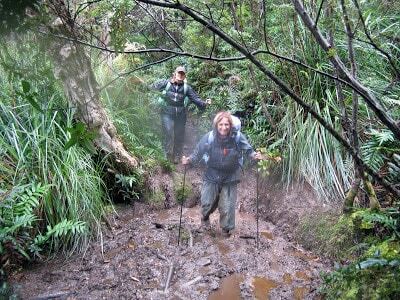 The day proved to be all it was cracked up to be: unbelievable mud stretches, hard, steep climbs, scrubby forest. We spent hours walking through tunnels in the sword grass or tunnels through the tee tree scrub – like rats in a maze. 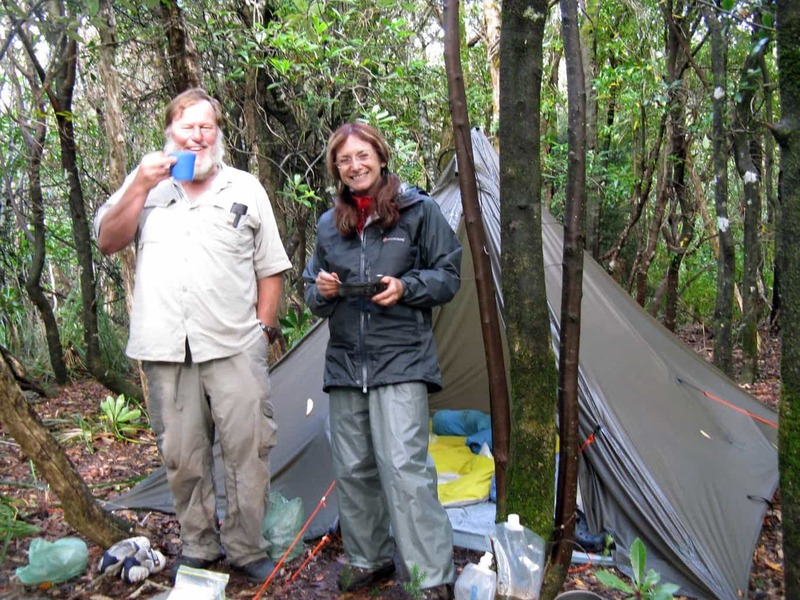 …..when, at last, we came in sight of South Cape Rivulet camp. Chapman notes that at the rivulet, a ‘deep wade’ leads to the camp on the other side. He also says, as an aside, that at high tide or after heavy rain it is best to wait for water levels to drop…. Of its black eddy bespate with flakes and plumes. Steve, in his careful preparations, had added to his pack a coil of spectra cord, in case of dangerous river crossings. 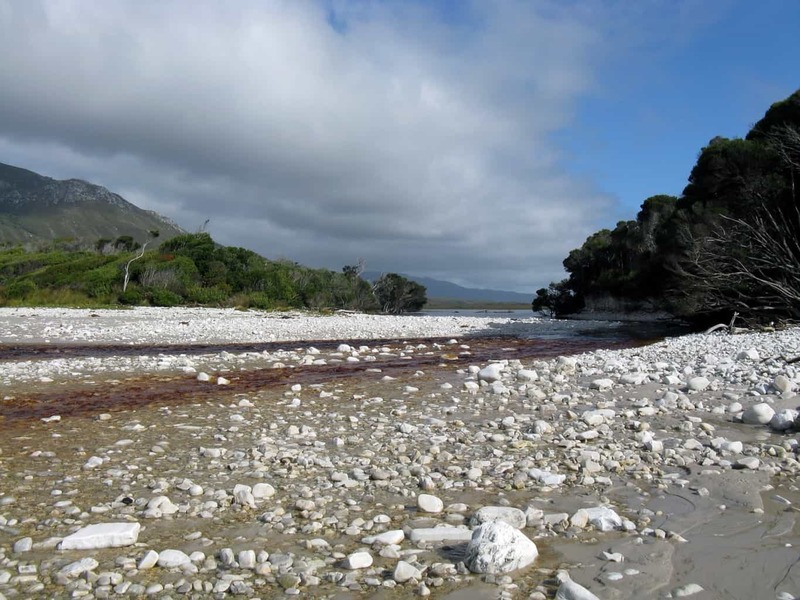 The lack of any trees on the far side of the estuary was a problem, but he tied one end of the cord metres behind us on the bank, and leaving his pack behind, waded across, waist-deep, between the assault of the waves. Timing was crucial, as it was necessary to wait for the incoming waves to flow and then ebb so that the water was not too deep, still leaving enough time to accomplish the crossing before the next crashing wave. He then anchored the rope while Kerri and I crossed, both losing our footings in the swift current and plunging holes, and here today only as a result of the rope. Steve finally returned for the packs while Kerri and I anchored the rope, and last of all he reclaimed the precious rope. Without his forethought and strength, I would not have survived that crossing with my limited swimming skills. All that remained was a shivering run to camp to remove our wet clothes before we were dangerously chilled, pitch the tents, get water, check our bedding for water infiltration (fortunately the dry-bags had held good), cook something hot, and warm up in our sleeping bags. Steve and I managed to get warm by donning padded coats and vests inside the sleeping bags. Kerri spent a colder and largely sleepless night. All of this was played out to a background symphony of wind : the raging roaring 40’s which had become gale-force. Only half a day to go…. Chapman says 3-4 hours. We hadn’t matched him before, so why should we today? 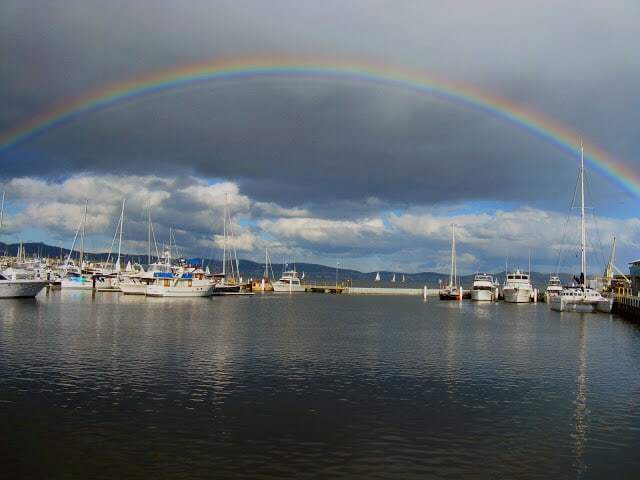 We sustained our exhausted minds and bodies with images of a day in Hobart before flying home: warm motel rooms, hot showers, restaurants, shopping….we waxed lyrical over these lost delights, to make the hours pass quickly. 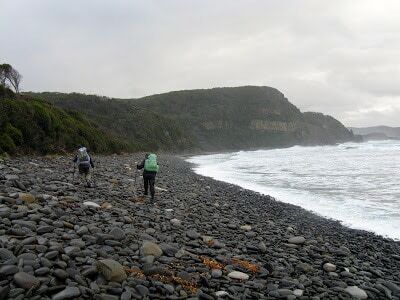 More long stretches of boulder beach staggering, more climbing: wild craggy cliffs towering over the Southern Ocean, with gale-force winds threatening to blow us over the edge. Such starved ignoble nature; nothing throve…. In fact, we heard a frog on this last buttongrass swamp crossing. In the entire walk, we had counted 2 frogs, 4 birds, one paddy melon wallaby, some seagulls, a dying penguin and a dying seal. Not exactly nature’s wonderland! Despite pushing ourselves to the limit, we took 4.5 hours for this last section. We would argue that it is impossible to do it in less. We emerged exhausted, bitter, cold, footsore and in need of some creature comforts, which I am pleased to say, Hobart supplied amply. We will return to Hobart, in particular the excellent Mezzethes Greek Restaurant in Salamanca. 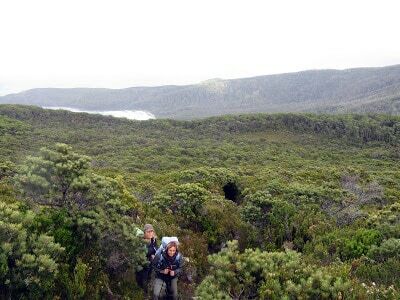 We will not return to the South Coast Track. Yep. This sums up our experience also. Our flight in Melaleuca was cancelled due to weather (pouring rain) so we bussed into Cockle to start. Two cold fronts were forecast. 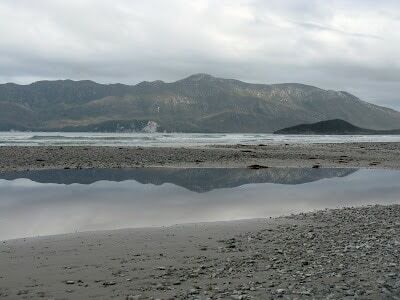 We walked the first two days in squalls and sleet showers with sun breaks. So cruel. Change after change of attire. Most notable the daily kms and hours estimated were completely wrong. 9km on map was about double under foot with steep and relentless rain forest stretches. 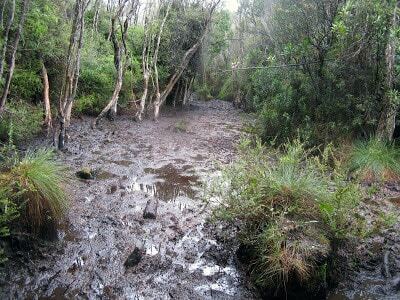 Mud, bogs and “holiday” vine (take a trip) slowed the progress, ensuring 10hour plus days on the trail to next suitable/available camp spot. Not fun. Hard hard work!! To contemplate up to 10 days under canvas, putting up, and down in the rain is not fun. We had snow at sea level day two in November. To add to our joy we had a lie saving helio extraction of one of our party due to a strep infection one day 3. Definitely no comms available so a PLB is absolutely essential. The terrain is a quantum magnitude harder than the Overland plateau. We warned. Hi Peter, Sounds like you had a much worse time of it than we did. It was an interesting walk but poorly routed and with far too few intermediate camp sites. I favor just scratching out 1-2 tent sites wherever there is a suitable spot (ie with water) to spread the people out and so you can take your time. I suspect no-one is listening to me as they all want to be ‘iron men’. Cheers, Steve. If you carry a small saw such as this (http://www.theultralighthiker.com/2017/06/02/whoopie-slings-what-a-great-idea/) there are spots you could make your own camp site.